DC Moore Gallery is pleased to announce the opening of Yvonne Jacquette. The exhibition features recent paintings and pastels depicting unique aerial views of New York City, New Orleans, and rural Maine. 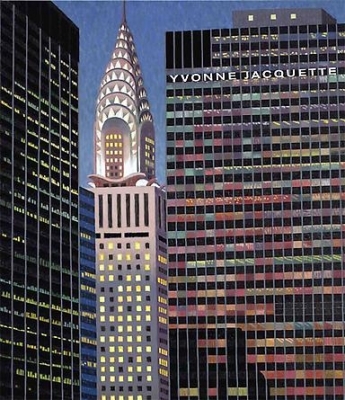 Since Jacquette has lived in New York for part of nearly every year since 1955, the city is, naturally enough, one of her primary subjects. Her paintings depict well-known buildings, famous bridges, neighborhood intersections, and the like with an architectural accuracy that allows individual structures to be readily identified. Jacquette also creates new compositions and arrangements, however, aided by pastel studies and documentary photographs. Her cityscapes are fluid and changeable, based on intuition, chance, and the fleeting nature of perception. In Chrysler Building Flanked by High-Rise Buildings III (2009) and Empire State Building II (2009), the landmarks are seen through other urban structures that heighten their dramatic presence. Jacquette’s work often explores night and the effects of bright lights, reflections, and indistinct objects set against the surrounding darkness. Paintings such as New Orleans II (2009) and Metropolitan Area Triptych (2008) focus on the dizzying array of illuminated freeways, bridges, boats, and streetlights as seen from above. While these paintings and pastels are made from direct observation, she frequently enlivens compositions through heightened color, repetition of certain elements, and manipulation of light, scale, and perspective. In recent years, Jacquette has photographed shopping malls and parking lots in rural Maine from a helicopter at night. The resulting paintings and pastels, such as Galaxy of Night Lights (2008), with their renderings of blocks and strings of colored lights, are among her most abstract. Jacquette has exhibited steadily since being included in a group show in New York City in 1962. Three years later, she had a one-person exhibition at Swarthmore College in Pennsylvania. In 1983, the St. Louis Art Museum organized her first major museum exhibition. A comprehensive retrospective, Aerial Muse: The Art of Yvonne Jacquette, originated at the Cantor Center for Visual Arts, Stanford University, California in 2002, and traveled to Colby College Museum of Art, Waterville, Maine; Utah Museum of Fine Arts, Salt Lake City; and the Hudson River Museum, Yonkers, New York. In 2008, the Museum of the City of New York organized Under New York Skies: Nocturnes by Yvonne Jacquette, which was shown concurrently with Street Dance, an exhibition of her late husband Rudy Burckhardt’s photography. The exhibitions were accompanied by a major publication, Picturing New York: The Art of Yvonne Jacquette and Rudy Burckhardt. Yvonne Jacquette lives and works in New York City and Searsmont, Maine. Her work is included in numerous public collections, including Brooklyn Museum, New York; Cleveland Museum of Art, Ohio; Hirshhorn Museum and Sculpture Garden, Washington, DC; Metropolitan Museum of Art, New York; Museum of Modern Art, New York; Philadelphia Museum of Art, Pennsylvania; and Whitney Museum of American Art, New York. A full-color catalogue with an essay by John Yau accompanies the exhibition.